We spend over 90% of our time inside buildings1. This means that buildings today are expected to provide the same nurturing environment as the outdoors, as well as leveraging technology to aid productivity and comfort, all while minimising operating costs, reducing Cybersecurity risk and downtime. The fact that 40% of the current workforce is set to retire by 20202 only brings in the additional challenge of the expectations of the millennial generation, who are poised to be in leadership positions across industries in the next few years. The concept of Smart Buildings is certainly not new – in fact, buildings have been getting ‘smarter’ from the advent of Building Automation solutions some decades ago. However, today’s definition of a ‘Smart Building’ goes beyond automated operation, towards intuitive operation. There are several considerations of what makes truly ‘Smart’ today. A Net Zero Energy building generates as much energy as it consumes on an annual basis. However, such a building will still emit carbon depending on the type of on-site generation, as not all buildings have the potential for renewable energy. With the likes of EU setting a Carbon Emissions reductions target of 40% by 2020, buildings need to move towards a Zero Carbon mode of operation, when no fossil fuel is burned on site. To counter the increased demand on clean electricity grids, generation and load shedding can be optimized using demand-response programs. The goal of a hospital environment is to improve patient recovery, while that of an office environment is to improve productivity. While their purposes may be different, Smart Buildings ultimately contribute to the well being of the occupants. For example, studies indicate that there is 35% less sick leave in well-ventilated buildings3. Therefore, a Smart Building is expected to intuitively adapt to the environment depending on occupancy, ongoing activities within the building that may affect air quality, and the environment outside the building. Millennials, who will form around 50% of the workforce by 2020, tend to value employee brand as they do their consumer brands. The phrase ‘this is how things have always been done’ does not bode well with this generation, and some of their priorities in their workspace include flexible working, technological aids, diversity, rapid personal and professional development alongside good work-life balance, and the power of their employer’s brand. This also means that they tend to be less loyal to their employer, and multiple employers in a short space of time has become the norm. Therefore, organisations need to invest in the culture, if not the people. By leveraging Smart Buildings that create an Innovative and Digital Environment, organisations can poise themselves to appeal to the best talents in the industry. Buildings have not lost the need to be as efficient as possible, with operators now looking for an integrated approach to Building Management. Smart Buildings are expected to be able to go beyond disparate systems, to an environment where the BMS, Lighting, Power, and Occupancy pieces can share data to improve operations, and there be some form of visualization of said agglomerated data on a platform that is easily accessible either on premise or on cloud. Today, buildings are expected to go even beyond systems talking to each other. Systems are expected to interact with people, and people expect to have control over their environment. Indeed, Smart Buildings are evolving to include artificial intelligence devices; to apps on your mobile device that crowd-source comfort conditions, or can help you choose and find your way to the ideal workspace in your office; to Virtual and Augmented Reality. Today’s Smart Building vision is that of a fluid environment, where everything you touch is part of the building’s DNA. So what is the Smart Building ‘gene’? The answer is simple – leveraging data and the Internet of Things to collect cross-system information, and come up with actionable insights. 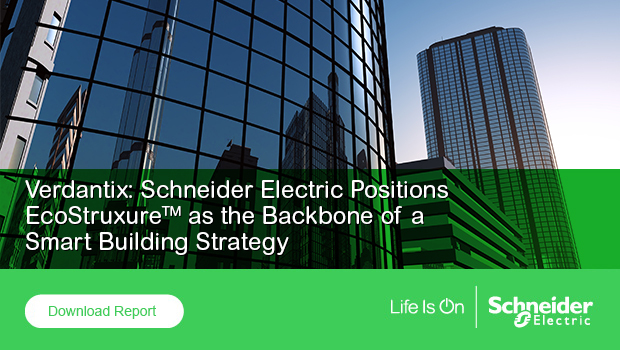 Platforms such as Schneider Electric’s EcoStruxure enable collaboration and efficient operation of multiple systems on a single pane of glass to provide intelligent and intuitive environments. In my next blogs, I will deep dive into some strategies for new and older facilities in adopting the Smart Building vision. The post The DNA of Smart Buildings: Part 1 appeared first on Schneider Electric Blog.